Super Clean 28 with Flag Blue Hull Color, w/Twin YAMAHA 300hp, T-Top w/Hardtop, Garmin Electronics, Fully Loaded, Boat is easy to see at Cozy Cove Marina, Rack stored without bottom paint, low Hrs., Call for Details !!! 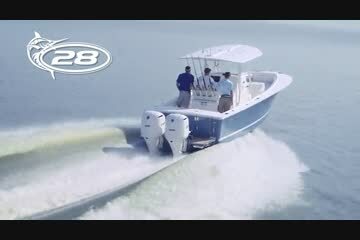 With its sharp bow entry and deep-vee hull, Regulator’s signature soft ride comes standard – and with the power of Yamaha F300 V6 twins and Command Link Plus controls, you won’t believe where this Regulator will take you. With a flush deck throughout the cockpit and plenty of storage, including a 124-quart transom fishbox, 456 quarts of in-deck fishbox space or rod storage, and two forward-seat 140-quart storage compartments, there–s plenty of room for fishing adventure. Cushioned bow seating delights sunbathers and the loaded console features tempered glass windshield and optional fiberglass T-top to shield from the sun as you head offshore.